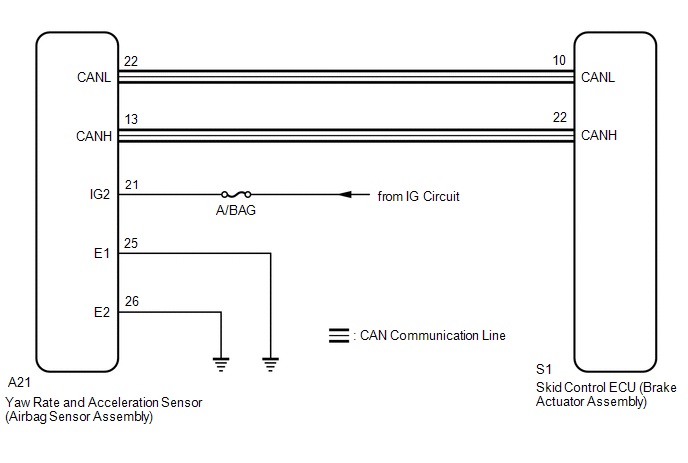 The airbag sensor assembly has a built-in acceleration sensor and detects the vehicle condition. 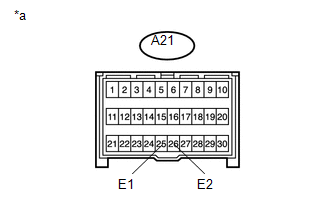 If there is trouble in the bus lines between the acceleration sensor (airbag sensor assembly) and the CAN communication system, the DTC U0124 (Lost Communication with Lateral Acceleration Sensor Module) is output. At a vehicle speed of more than 3 km/h (2 mph), the acceleration sensor power source malfunction signal is received for 10 seconds or more. After turning the ignition switch off, waiting time may be required before disconnecting the cable from the battery terminal. Therefore, make sure to read the disconnecting the cable from the battery terminal notice before proceeding with work (See page ). 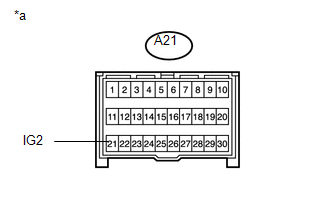 (d) Disconnect the A21 yaw rate and acceleration sensor (airbag sensor assembly) connector. (e) Connect the cable to the negative (-) battery terminal, and wait for at least 2 seconds. (g) Operate all the components of the electrical system (defogger, wipers, headlights, heater blower, etc.). (h) Measure the voltage according to the value(s) in the table below. (a) Reconnect the A21 yaw rate and acceleration sensor (airbag sensor assembly) connector. (c) Turn the ignition switch off. (e) Perform a road test. (f) Check if the same DTC is recorded (See page ).